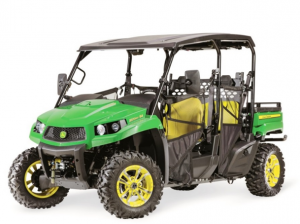 The John Deere is recalling the XUV590 S4 Gator utility vehicle due to a throttle cable issue. The two-passenger John Deere XUV590 is part of the recall as well. 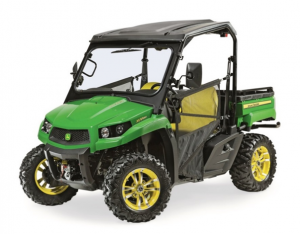 John Deere is recalling XUV590 and XUV590 S4 Gator utility vehicles sold between September 2017 and August 2018 due to a powertrain issue. The powertrain hardware can become loose and cause the throttle cable to stick. As a result, the operator may not be able to stop the vehicle. The recall involves approximately 4,700 vehicles including 200 in Canada. To date John Deere is reporting no injuries because of this issue. Vehicle owners should stop using the vehicles immediately and contact their local John Deere dealer for a free inspection and repair. Compared to John Deere’s overall Gator utility vehicle sales, this recall is fairly large but small compared to typical recalls in the industry. SVR maintains an ongoing list of recent recalls of UTVs, golf cars and LSVs. Hazard: The powertrain hardware can come loose, causing the throttle to stick. This could result in the operator not being able to stop the vehicle, posing a crash hazard. Consumer Contact: Deere & Company at 800-537-8233 from 8 a.m. to 6 p.m. ET Monday through Friday, 9 a.m. to 3 p.m. ET on Saturday, or online at www.deere.com and click on “Product Recall Information” on the drop-down menu under “Services & Support” for more information. Description: This recall involves John Deere Gator utility vehicles with model number “XUV590” or “XUV590 S4” printed on the hood. “John Deere” and “Gator” are printed on the cargo box. The serial number is located on the frame on the rear of the machine above the hitch and begins with 1M0590 and falls within the ranges on the chart below. The recalled utility vehicles were sold in green and yellow, olive drab and camouflage and have four-wheel suspension with side-by-side seating for two or four people. Remedy: Consumers should immediately stop using the recalled vehicles and contact an authorized John Deere dealer for a free inspection and repair. John Deere is contacting all known purchasers directly. Incidents/Injuries: John Deere has received two reports of the throttle cable sticking. No injuries have been reported. Sold At: John Deere dealers nationwide from September 2017 through August 2018 for between $10,000 and $13,000. This entry was posted in Uncategorized and tagged Consumer Product Safety Commision, CPSC, Gator, John Deere, recall, throttle cable, X, XUV590, XUV590 S4 by Marc Cesare. Bookmark the permalink.